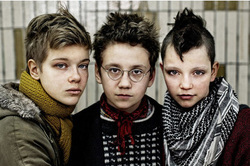 Lukas Moodysson's "We Are the Best!" captures the screw-loose joy of youth with consummate ease and grace. The time is 1982 and the place is Stockholm, where three middle-school girls are determined to start a punk band, even though they know punk is over and two of the three have no instruments or discernible musical skills. (The existence of chords and harmony comes as news to them.) Don't be put off by the punk, or by what might strike you as a depleted era of pop history. The true—and universal—concerns of this blissfully funny film are living life, pushing limits, making a mark, discovering love. And don't expect a standard coming-of-age story, since the outcome is mercifully free of intimations of maturity. It's a being-of-age story, in Swedish with English subtitles, the age being early adolescence, when kids with throbbing hearts and incompletely wired brains are full of passion and blithe illogic. The premusical members of the punk trio—atonal can't convey the gleeful racket they manage to make—are Bobo (Mira Barkhammar) and her buddy Klara (Mira Grosin). They are, both of them, 13 years old, and so thoroughly lovable that every glimpse of their funny faces brings new delight. Bobo is the tender tomboy, quiet and seemingly earnest behind her round, steel-rimmed glasses. Klara is the impish one, sporting hair that she's spiked with soap; neither her pretty face nor her whirligig mind are ever in repose. Half a century ago, when Bergman was in his prime, the arrival of a new film by the Swedish master, or by other masters in other countries, was a significant event for a significant number of American film lovers. Times have changed, of course. Foreign films as a cultural movement have lost much of their luster in the era of the multiplex, and of marketing bombardments whose budgets routinely run to many tens of millions of dollars. On a week when two heavily marketed studio productions will open on thousands of screens, this little Swedish comedy will be hard for filmgoers to find. But Mr. Moodysson's film is little only in physical and financial scale. When measured by the pleasure it confers, "We Are the Best!" is a big deal that will be winning hearts—and even grownup minds—for a long time to come.